During the hot, dry months from July through September we really appreciate the effects of our mediterranean climate. Watering is foremost in every gardener’s mind and using water wisely is becoming a necessity. Garden mulches can play an important role in water conservation and much, much more! So grab a cup of coffee (or tea), sit back and consider the many facets of garden mulches. One key element of water-wise gardening is insuring that water doesn’t evaporate away before your plants can use it. Two good ways to do this are: 1) to use water-efficient irrigation methods (more on this in September) and 2) to use garden mulches. Mulches are particularly important in a young garden like Mother Nature’s Backyard. 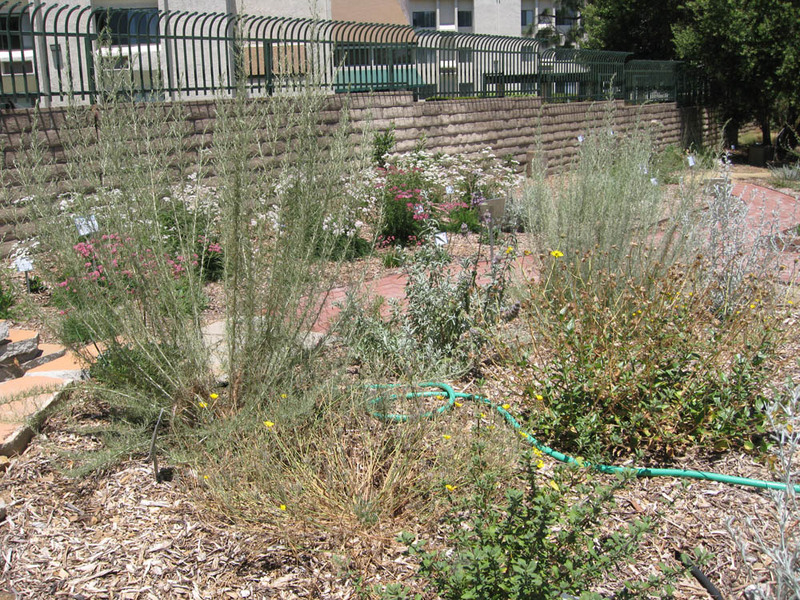 Evaporation is a key issue in all Southern California gardens, but young gardens are particularly vulnerable until plants become established. A mulch is simply a protective layer spread on the surface of the ground in a garden or landscape. There are many types of mulch - and they serve multiple purposes in home gardens. In fact, there’s more to choosing and using mulches than most gardeners think. We hope this posting helps you understand the range of mulches available - their best uses, strengths and limitations. Mulching around local native plants requires some additional consideration, so we’ve included a discussion on Mulches and S. California Native Plants under Special Topics at the end. Water conservation is high on the list of reasons why gardeners use mulches. Mulch serves as an insulating layer, helping maintain even soil moisture throughout the garden and throughout the year. A good layer of mulch significantly prevents water loss due to evaporation. Research suggests that evaporation rates are decreased 50-70% when soils are covered by a layer of mulch, regardless of whether the soil is sandy, clay or something in between. Mulches decrease soil water evaporation in several ways: 1) by decreasing the soil temperature; 2) by protecting the soil surface from the drying effects of wind; 3) by creating a layer of moist air between the soil surface and the mulch. All of these are important determinants of water evaporation rates. Mulches also prevent soil erosion due to wind and water runoff. They help to both increase water infiltration and decrease water runoff. Mulches decrease the speed and force of water droplets, allowing them to soak into the soil rather than run off. They prevent the formation of the soil surface crusts that can result when water droplets hit and compact bare soil; this also helps to prevent water run-off. And mulches prevent mud from splashing onto plants – which can be ugly and spread disease and fungal spores. Mulch is important year-round because the infiltration effects are the same for irrigation or rain water. Mulches are also used to suppress weed growth. Many weed seeds need light to germinate; block the light with a layer of mulch and they won’t germinate. Other weed seedlings have a difficult time pushing up through a layer of mulch. Mulches even help when weed seeds blow in from outside sources. It’s often easier to remove weed seedlings from mulched areas – the roots are less well established and weeds are noticeable while they’re still small. Preventing weeds from growing insures that more water – and more soil nutrients – is available for your garden plants. Mulches can be used to change the temperature of a garden’s soil. We usually think of the cooling effects of organic mulches like bark chips. A layer of bark – or other organic mulch – does protect shallow roots from excessive heat (or cold). But the soil warming effects of a gravel mulch can be highly beneficial for winter/spring wildflowers, native bulbs, desert plants and cool-season ornamental grasses. Similarly, you might use gravel or brick pathways in a vegetable garden to warm the soil in spring and retain soil heat in cooler coastal gardens. You might even be able to grow watermelons – in some years – in foggy South Redondo! Some mulches actually change the composition of soil over time. For example, bark, straw and other organic mulches will decompose, releasing their nutrients into the soil. The decomposition of organic mulch provides food for beneficial soil organisms while adding organic matter (humus) to the soil. Soil humus increases the availability of certain nutrients (particularly important in sandy soils). But it also increases air spaces in clay soils and enhances a sandy soil’s ability to hold water. We’ll discuss more about garden soils next month (August, 2012). Another common use of mulches is to provide access to the garden. Mulch materials can be used to create permeable pathways throughout the garden. Mulched walkways decrease soil compaction and help limit foot traffic. This is particularly important for gardens with clay soils. On a practical note, mulches will also keep the mud off your shoes! Mulches can be used to give your garden a tidy, finished appearance. This is especially important in a young garden, where the open spaces between plants can appear enormous compared to the new plants. By mulching between plants you not only conserve water, you also indicate that your new garden is a ‘work in progress’. Renewing mulches yearly will continue to provide a professional, finished look to your garden over time. Some mulches are used simply because they are decorative. For example, you might use an attractive pebble mulch around a fountain or sculpture to set it off from the rest of the garden. A mulch of ‘glass pebbles’ or recycled landscaping glass can be used to add color to pots, walkways, infiltration ‘streams’ and meditation gardens. The landscaping industry continues to develop interesting and decorative materials to make your garden more beautiful and functional. Some of these are even made from recycled materials like glass, old tires and recycled plastic! Finally, some mulches are used because they are simply more functional than plants or impervious hardscape in certain situations. For example, gravel or crushed rock may provide the perfect ground cover for a utility area. These and other inorganic materials can be used to create a low-maintenance, zero irrigation patio or seating area that allows rain water to percolate into the ground. In summary, mulches have a number of potential benefits and uses in the home garden. Understanding which type of mulch is best for a given application is the key to reaping these benefits in your own garden. There are two main types of mulch: organic and inorganic. Organic mulches are made directly from plant materials including wood, bark, leaves, nut hulls, etc. Inorganic mulches come from non-living sources or from recycled products like rubber or paper/cardboard. There are a number of commonly used mulches in both the organic and inorganic categories (see the table below). There is no one ‘universal mulch’ that’s superior for all situations. The trick to success with mulches – particularly when you’re using them around plants - is matching the mulch to the plants. A good basic rule is to mimic the type and depth of mulch that occurs naturally around a plant. The table below gives some suggested ‘best uses’ for different types of mulch. This table is a good place to start. But you will be a more successful gardener if you go beyond the table. When mulching around a specific tree or shrub, go on-line or consult a good gardening book to learn about the natural setting in which it grows. For example, a Magnolia (which grows on the edges of swamps in Southeastern U.S.) will have a very different natural mulch than a Jacaranda tree (native to drier open woodlands of Argentina). The more you know about the natural conditions under which a plant grows, the better you can mimic these conditions in your garden. And the best way to keep your trees/shrubs healthy is to follow nature’s cues – there simply is no better gardener than Mother Nature herself! How to apply mulch: mulches need to be thick enough to effectively prevent evaporation and weeds, but not so thick that they promote disease. A good rule of thumb is 2-4 inches deep for organic mulches and 1-2 inches deep for inorganic mulches. If your soil drains slowly, use the minimal suggested depth; if you have a well-drained soil, then you can use up to the maximum. And remember, take your cues from nature as to the correct amount of mulch. See the section on Mulches and S. CA Native Plants for recommendations specific to local native plants. Before applying mulch, the area should be completely weeded. Trust us – it’s easier to remove the weeds before you mulch rather than after. This is also the time to check your irrigation system and make any needed repairs/changes. We suggest that you water the soil deeply just prior to mulching to insure that plants are well-watered during the transition period while the mulch is settling. When applying mulch, be sure to leave 6-8 inches of bare ground around the trunk or stem of each plant. This helps prevent fungal diseases and discourage gophers and other rodents that might chew on the trunk. In most cases, mulches should be applied in a flat layer (rake to smooth) and not mounded; never mound up mulch around tree trunks. Avoid packing organic mulches – this diminishes their benefits and makes it difficult for water to penetrate. Water the mulch thoroughly after application to start the settling process. Monitoring soil moisture is important after you mulch. You’ll probably need to water less - and may actually run the risk of over-watering your plants. You’ll have to dig down into the soil (beneath the mulch) to see if it’s dry – or use a soil moisture sensor. Remember, more garden plants are killed by over-watering than under-watering. For more on watering see the post on Water Zone/ Hydrozone Gardening, April 2012. When to apply mulch: organic mulches break down over time, so you’ll need to re-apply fresh mulch. Inorganic mulches may need occasional renewal as they settle. It’s a good practice to check the depth of mulch yearly, to see if new mulch is needed. If you have a well-drained soil, a good time for mulching around native plants is in the fall, after you’ve completed your fall pruning and before the winter rains begin. Another good time to apply mulch is in the spring, as you prepare the garden for the dry season. If you have a heavy clay soil, we suggest you apply new mulch in the spring. That’s what we do here in Mother Nature’s Backyard. 1. First, figure out the size of the area you want to cover in square feet (multiply the length times the width). 2. Next, decide how deep you want your mulch to be, in inches. 4. Divide the number you get in #3 by 324. This is the number of cubic yards of mulch you will need. 5. If you are purchasing bags of mulch, you will need to divide the cubic yards of mulch (#4) by the number of cubic yards per bag. Most bagged garden products are listed by the cubic foot rather than by the cubic yard. So first convert cubic feet to cubic yards with the following conversion factor: 1 Cubic Foot = 0.037 Cubic Yards. Then divide the number of cubic yards needed (#4) by the number of cubic yards per bag. This will give you the number of bags of mulch you will need. Let’s take an example. You need to mulch an area that measures 15 ft. by 10 ft. So now you can calculate the amount of mulch you need like a pro! Mulches and S. California Native Plants: We are blessed with a wonderful gardening climate in western Los Angeles County. The fact that we can – and do - grow plants from several California plant communities actually makes choosing appropriate mulch(s) a little more complex. Beginning native plant gardeners sometimes assume that all California native plants need a 2-4 inch layer of bark mulch. This idea probably got started in northern California, where many of their native plants do produce a good layer of organic mulch. In contrast, some of our local native plant communities actually produce very little ‘natural mulch’, while others (like local Chaparral & Oak Woodland) are indeed characterized by a thick layer of organic mulch. Using the correct mulch can mean the difference between success and failure with native plants. For example, many gardeners are surprised at the number of local wildflower seedlings that germinate in their decomposed granite pathways. This phenomenon really shouldn’t surprise us – after all, these plants evolved to reseed on bare ground or in an inorganic mulch. Using a gravel/inorganic mulch makes sense if you want to grow the wildflowers and bulbs native to our coastal areas. When using mulches around California native (and other water-wise) plants, it’s particularly important to consider both the type and thickness of ‘natural mulch’ that surrounds them in the wilds. In general, plant communities that include trees and large shrubs produce more mulch than communities composed of smaller shrubs and grasses. But there are some nuances depending on the Plant Community. To help you, we’ve given some mulching recommendations for the Plant Communities most used by local gardeners (see table below). We hope this clears up some confusion about mulching common native plants. Garden mulch(s): no mulch or inorganic rock mulches, especially for wildflowers & bunchgrasses; thin (1 inch) layer of organic mulch ( leaf mulch, wood chips or bark) is OK around shrubs & sub-shrubs. You can let leaf litter build up as a natural mulch under shrubs. Occurs: Palos Verdes Peninsula; south and west-facing hillsides from 1000-3000 ft elevation in much of Los Angeles County. Usually drier climate than Chaparral. Typical plants: Many medium-size shrubs ( < 6 ft tall) and a few larger shrubs/trees commonly thought of as typical CA natives: Sages (Salvias); Lemonadeberry; Bush Monkeyflowers (Diplacus species); CA Sagebrush (Artemisia californica; native currants & gooseberries (Ribes species); Baccharis species; ); CA Fuschia ; native Goldenrods; local Penstemon species. Occurs: mostly western, northern & eastern slopes of the southern California mountains. Elevation generally above that of coastal sage scrub and with more rainfall. Santa Monica Mountains and foothills of San Gabriel Mountains. Typical plants: Desert plants: cacti; annual wildflowers; desert perennials; desert shrubs; desert trees including Desert Willow (Chilopsis), Palo Verde, Desert Olive, etc. Garden mulch(s): 2-4 inch layer of organic mulch; leaf mulch is excellent – others are fine. · The young garden looks empty – mulch makes it look less so. · Soil water evaporates most readily from un-shaded soil. As more soil is shaded, evaporation decreases significantly, so your garden actually needs less mulch as areas become shady. · Young plants have less developed root systems; this makes them more vulnerable to dry soils. Mulch plays a key role in keeping the soil moist and cool for young, shallow roots. As a plant matures, its roots generally penetrate the soil more deeply and widely. A mature plant is tapping deeper sources of water and can withstand more surface dryness. This is why many older trees and shrubs – even non-native ones - are quite drought tolerant. · Young gardens are more vulnerable to wind and water erosion. Until roots bind the soil, fall winds and winter rains can cause significant erosion. Erosion decreases as plants mature – even on slopes. · A young garden has less natural mulch. As trees/shrubs mature they drop leaves and twigs, providing natural mulch beneath them. Thus gardens may need less purchased mulch as they mature. · Many mature California native trees and shrubs actually need the surface layers of the soil to dry out between deep waterings. If the upper layer of the soil remains too wet, root fungal diseases can thrive, decreasing the lifespan of native – and other water-wise - plants. As your garden matures, take the time to re-evaluate your mulching strategy each year. This allows you to spend your time, effort and money wisely – and insure the health and longevity of your plants. Is there such a thing as too much mulch? Unfortunately, yes – particularly when you garden with water-wise plants. The key is to balance the good aspects of mulch (deep enough to reap the benefits) with the potential drawbacks of too deep a layer of mulch (water-logged soils; soil fungal diseases/pests; water not reaching the soil). We’ve discussed several factors that influence mulch requirements including soil drainage, the maturity of the garden and the optimal mulch needs of individual plants. The other important factor is the amount of water the garden receives – both from irrigation and from rain. Mulching too thickly can cause problems, particularly if you also water regularly or if your soil drains slowly. In fact, you need to monitor your soil moisture to be sure that you aren’t over-watering your garden. The key to healthy mulching is: 1) knowing the optimal mulch requirements for your plants; 2) not over-watering mulched areas, particularly those with water-wise plants; 3) checking occasionally to be sure that the bottom layer of mulch does not remain soggy, have a sour smell or show signs of fungal growth (mushrooms; thread-like white or gray hyphae). If your mulch seems too wet, cut back on watering and monitor soil moisture. If your mulch has a sour odor or you see signs of fungi, also consider aerating the mulch by raking/turning it or removing the affected areas and replacing with new mulch. Can I use several different kinds of mulch in a garden? Yes – in fact that’s often a good idea. For example, you may want to use a bark or wood chip mulch around your shrubs and a gravel mulch for your native wildflowers or in a native bulb area. We use both organic (chipped wood) and inorganic (gravel; sandstone chunk) mulches in Mother Nature’s Backyard. The following on-line resources provide more information about mulches. Remember that not all of the specific recommendations may be appropriate for our area or for mulching California native plants.